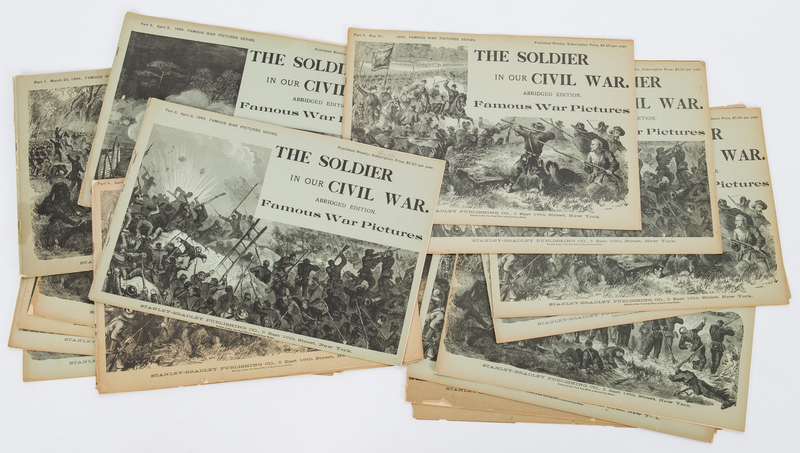 Twenty-one (21) Civil War Related Paper items, including Harper's Pictorial History of the Civil War. 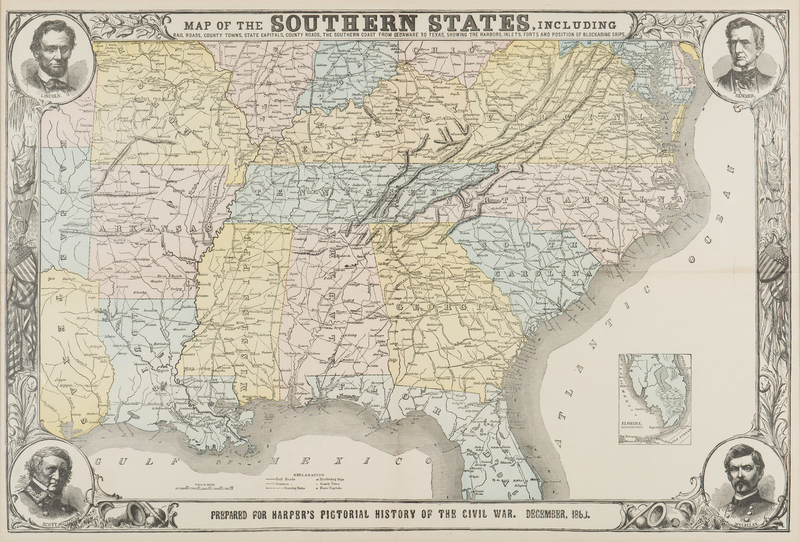 1st item: "Map of the Southern States, Including Rail Roads, County Towns, State Capitals, Country Roads, The Southern Coast from Delaware to Texas, Showing the Harbors, Inlets, Forts and Position of Blockading Ships" prepared for Harper's Pictorial History of the Civil War, December 1863. Wood cut engraving with color depicting the Southern States of America with portions of Ohio, Illinois, Indiana, Kansas, Texas. 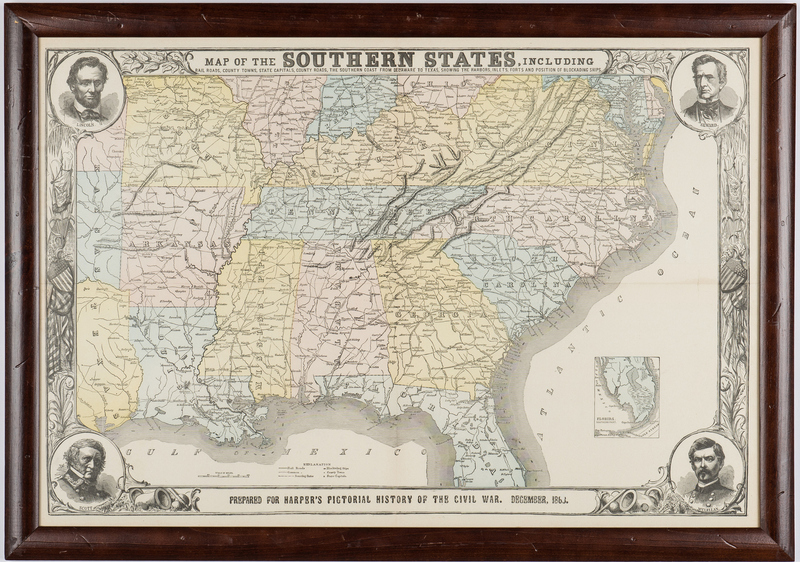 Inset map of the southern part of Florida, lower right. 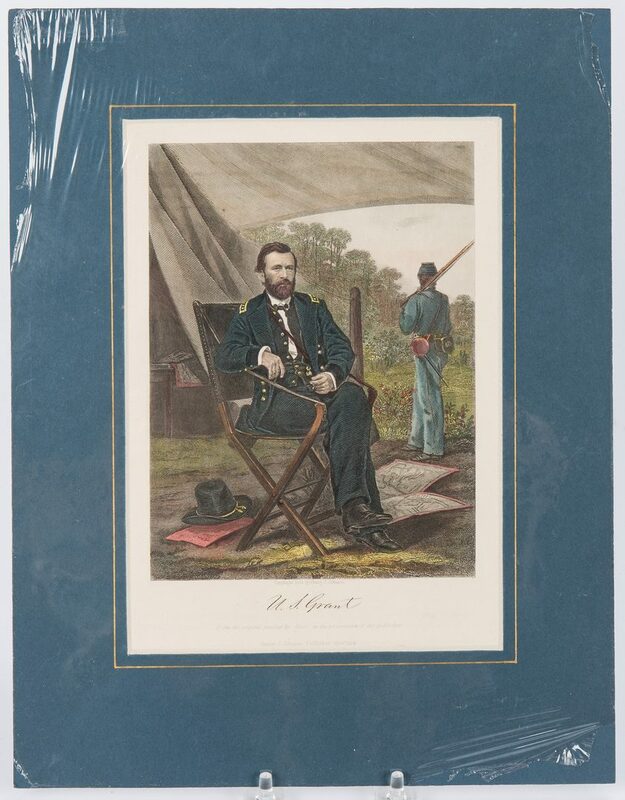 Vignette portraits of Abraham Lincoln, Winifred Scott, William H. Seward, and George B. McClellan at each corner. Scale and explanation, lower left and center. 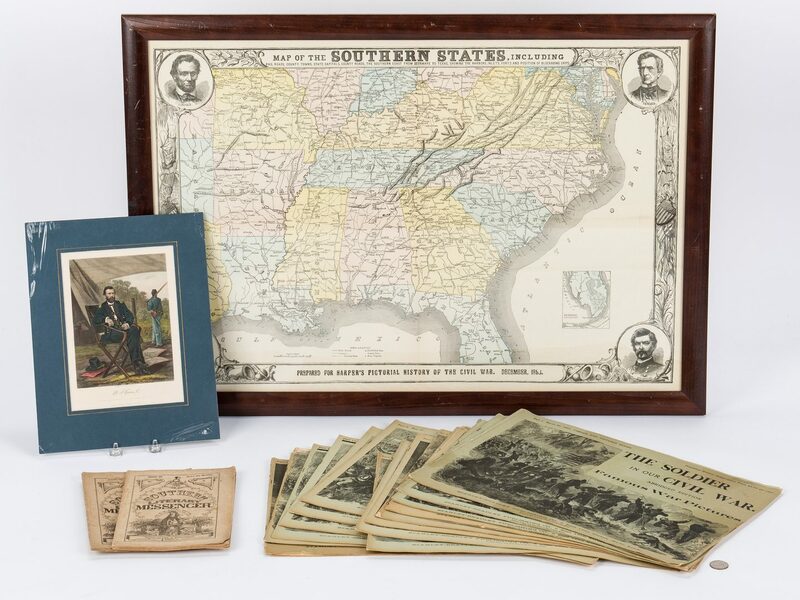 Housed under glass in a wooden frame. 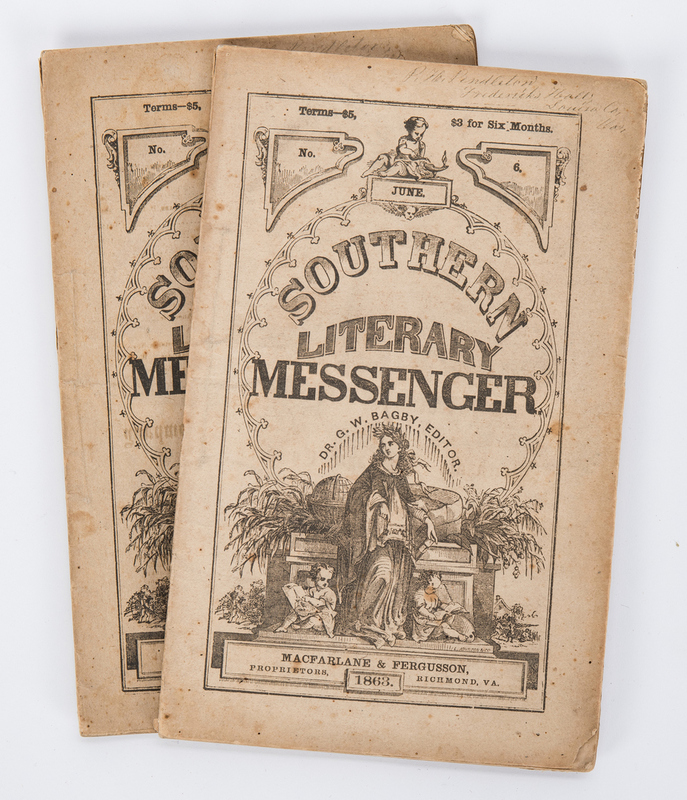 Sight – 21" H x 31" W. Framed – 24" H x 34" W. 2nd-3rd item: Two (2) Civil War era copies of the Southern Literary Messenger, edited by Dr. G.W. Bagby, No. 6, June and No. 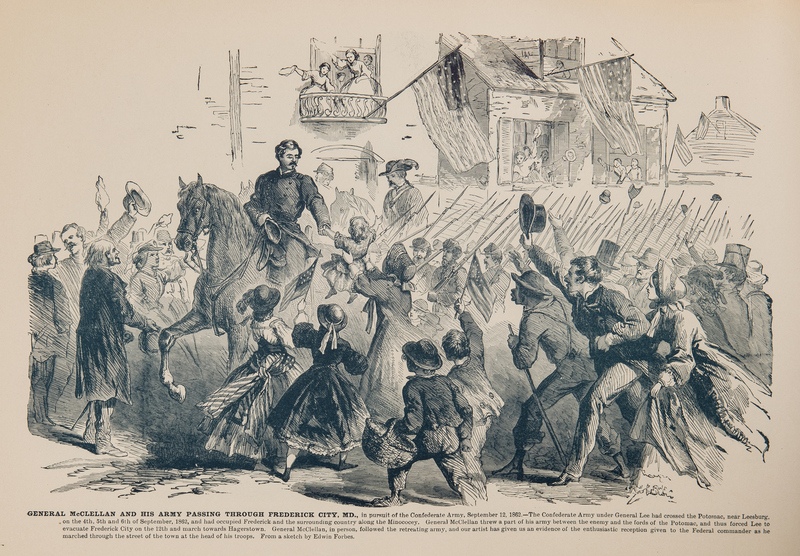 7, July, 1863. 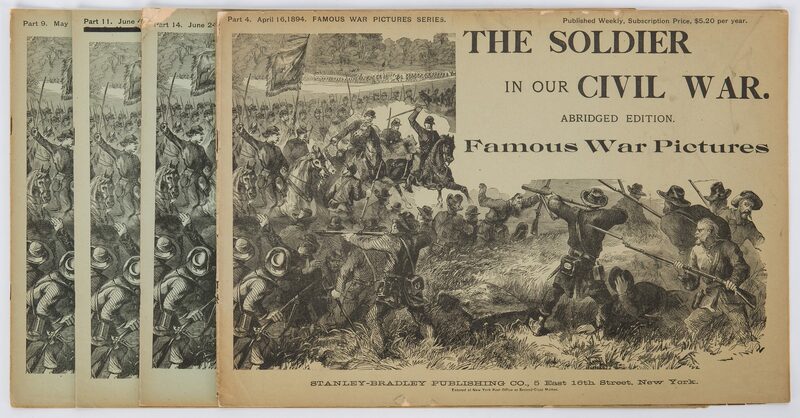 Published by MacFarlane and Ferguson, Richmond. 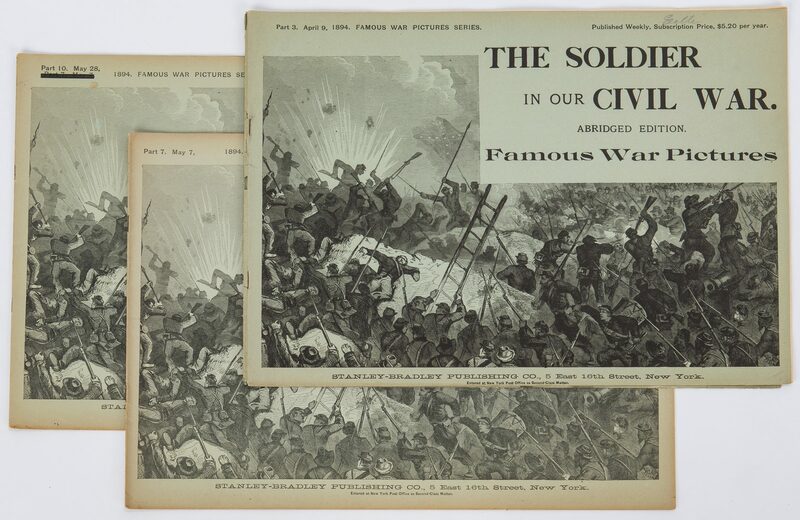 Softcover octavo, approximately 63 pages, soft cover self wrappers with engraved front wrapper and advertisements to back wrapper, articles include "History of the War" and other articles about Civil War issues, including an announcement of General Thomas Jonathan "Stonewall" Jackson's death in the June issue, and articles about popular books, including Les Miserables. Both inscribed "P.H. Pendleton Fredericks' Hall Louisa Co. Va" top right of front cover. 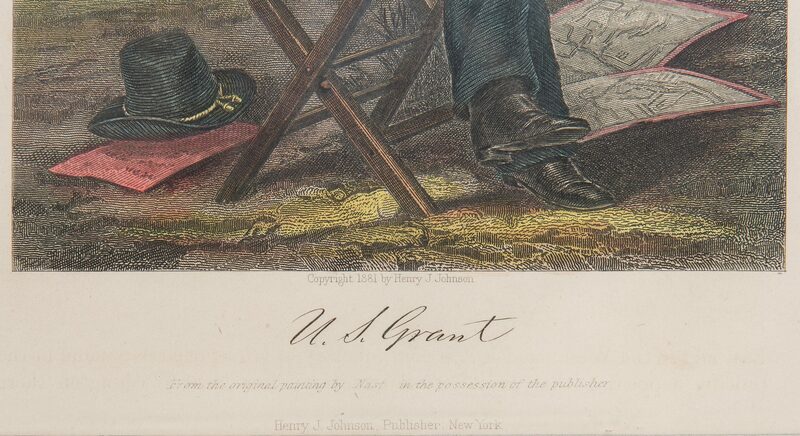 9 3/4" H x 6 1/8" W x 1/4" D. 4th item: Engraved print with color titled "U.S. Grant" after the original painting by Thomas Nast (New York/New Jersey/Ecuador, 1840-1902), published by Henry J. Johnson, New York, 1881. 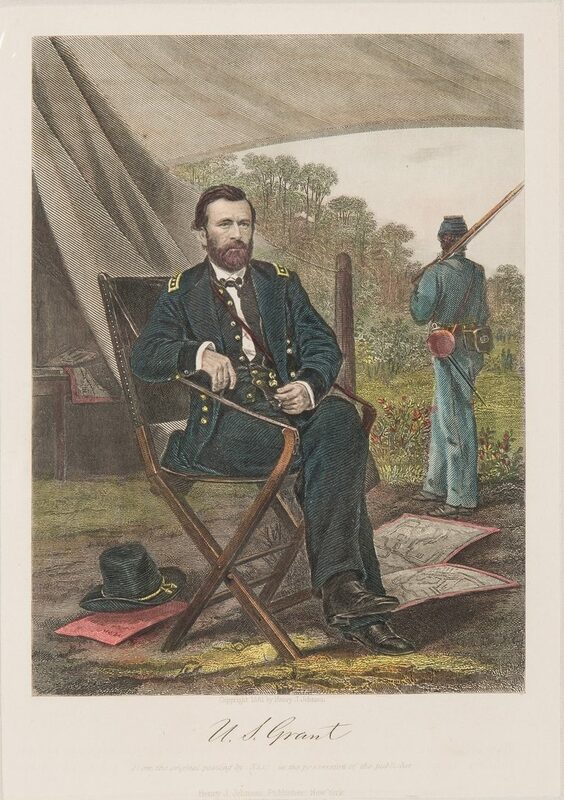 Depicts Grant seated in a tent presumably on a battle field, with maps and his hat at his feet, a Union soldier on guard duty at the entrance of the tent. Housed in a blue mat and wrapped in plastic. 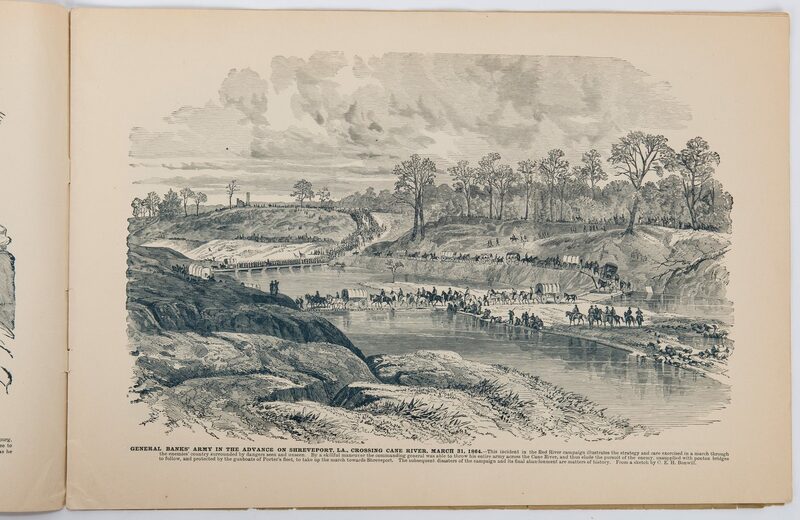 Sight – 9" H x 6 3/8" W. Mat – 13 1/4" H x 10 1/4" W. 5th-21st items: Sixteen (16) parts of "The Soldier in Our Civil War, Abridged Edition" published weekly by Stanley-Bradley Published Company, New York, March 25-July 9, 1894. 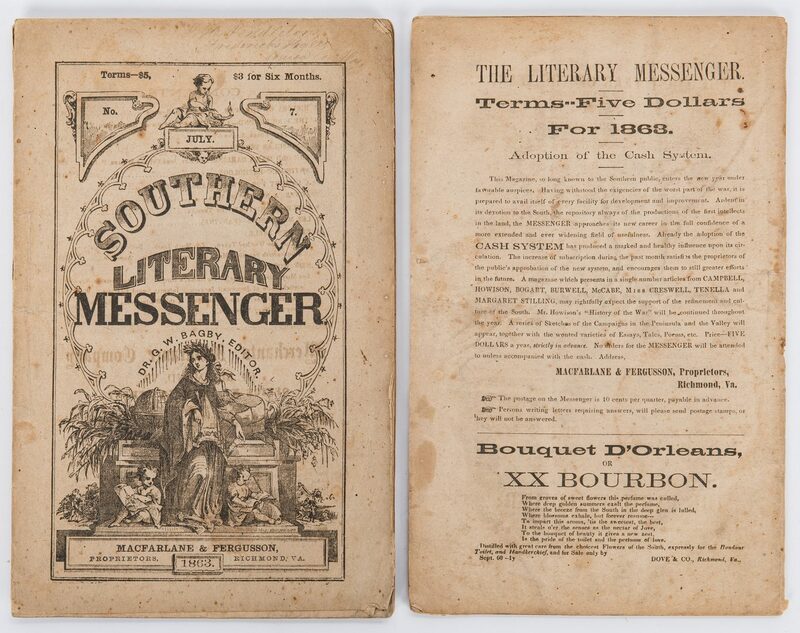 Self-wrappers, approximately 8 double-sided pages with illustrations. 11 3/4" H x 17 1/8" W x 1/16" D. Mid/late 19th century. CONDITION: 1st item: Overall good condition with toning. Not examined outside of frame. Slight printing error to "3" in date. Frame with scratches. 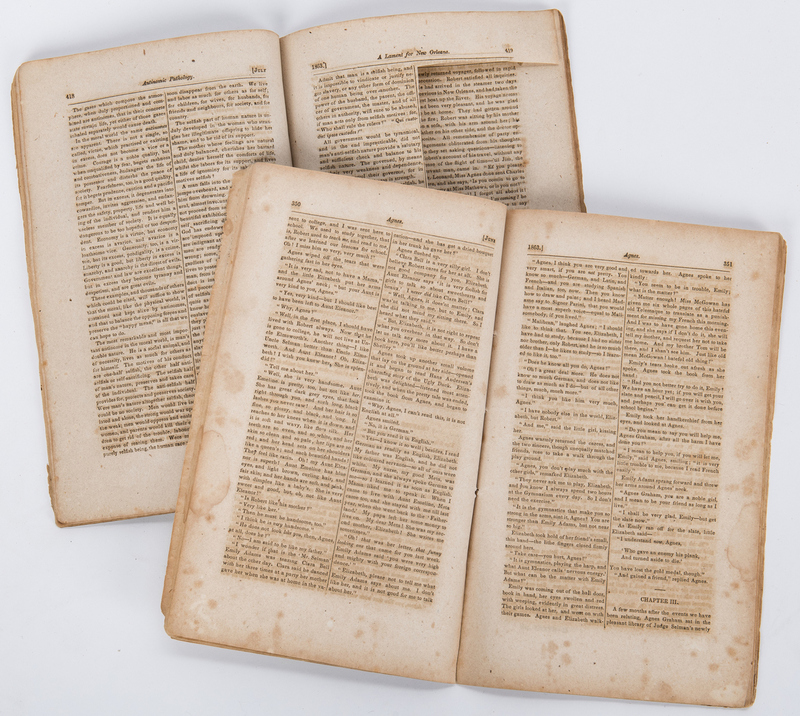 2nd-3rd items: Overall good condition with foxing spots, tears, toning/toning impressions, dampstaining, etc. to be expected from age. 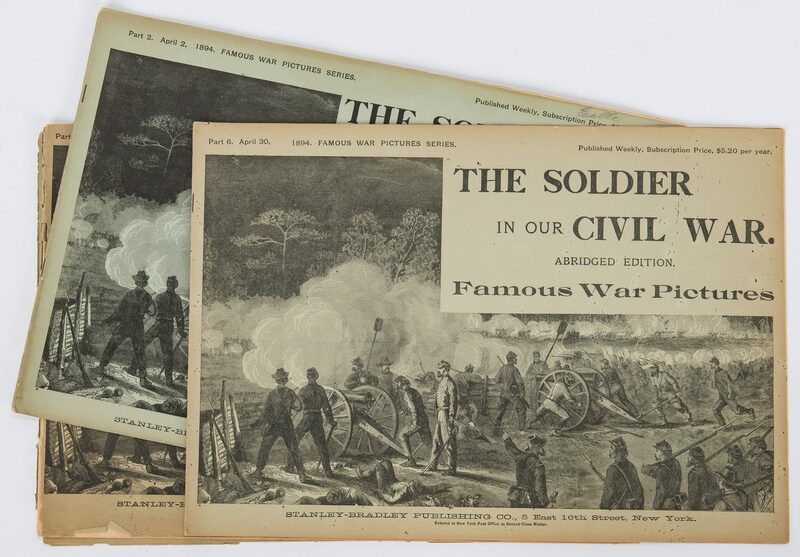 A few columns of test have been cut out, including part of the "Stonewall" Jackson article in the June issue. 4th item: Print in overall very good condition. Not examined outside of mat. Tears, largest 4 1/2", to plastic wrap. 5th-21st items: Overall good condition with toning, tears, wear, etc. to be expected from age. Some covers are separated from spine.